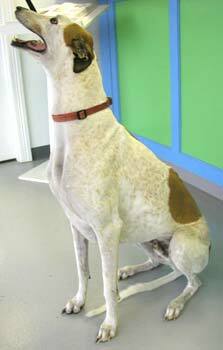 Bubba is a stunning 4-year-old red and white greyhound. 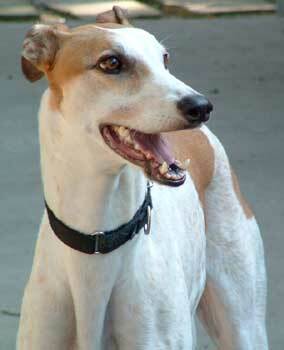 Bubba came to GALT as an owner surrender. Bubba's coat is shiny and soft and he is very smart! He knows his obedience commands - sit, stay, and down - and performs them without a flaw. He crates very well and is completely house broken. 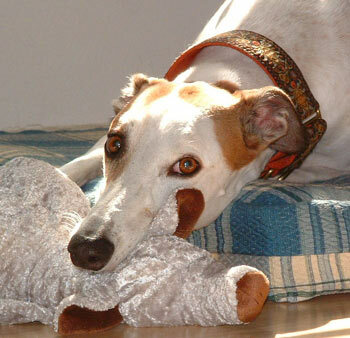 Bubba walks very well on a leash, and just wants to please and will make a greyt buddy. Bubba is not cat or small animal tolerant, and needs to be in a home as an only pet and without children. Bubba thoroughly enjoys going for walks and gets so happy when his leash is picked up. He is a goofy boy who enjoys singing along with his foster mom (that's called rooing in greyhound talk), likes to toss and play with stuffy toys and enjoys chasing squirrels in the backyard. Bubba has a heart as big as his smile, and will make a wonderful companion for the right person.